The Hayloft01900 825695work Self-cateringLocated in a peaceful rural hamlet in the Lake District National Park. Easy access to fells, lakes and Solway coast. A 17th Century converted stone barn with lofted ceilings and exposed stone walls. The Hayloft has a king-size bed with 100% cotton bed linen with duvets. A cot is available for babies up to 15kg in weight. Plenty of books, games and things for the children. Garden to enjoy, with garden furniture, picnic tables and barbecue facilities. Ideally situated in a quiet hamlet, forming part of the Allerdale Ramble near Bassenthwaite Lake, you can amble along to the next village admiring the valley scenery with the River Derwent below. Keswick is 8 miles away. You can take a 20 minute drive to the beach at Mawbray, along the Solway Coast, a very accessible area of outstanding natural beauty with long flat beaches and coastal walks. More strenuous walks are Skiddaw or the Buttermere range. We can recommend something less daunting that still give spectacular views. Other activities nearby include horse riding, fishing, canoeing, sailing, Whinlatter Forest park, golf and well-established biking routes to suit all abilities. Cockermouth has plenty of restaurants from traditional Chinese, Indian, vegetarian and Italian and some very interesting local pubs and brews. So if you fancy dining out there is plenty of choice and some will deliver to the door. Arrival time 16.00 and departure time 10.30. All children welcome. The Hayloft offers weekly bookings starting on Saturday and sometimes short breaks. Single-story converted barn with 1 double bedroom with king-size bed. Shower and bath combined. Wi-Fi broadband with wireless access point. A small sofa bed, located in the lounge, can sleep a third person - this attracts an additional daily supplement of £8. Same price for 1 to 2 people plus baby up to 15kg in weight A small sofa bed, located in the lounge, can sleep an additional person - this attracts an additional daily supplement of £8. We were given a warm welcome. 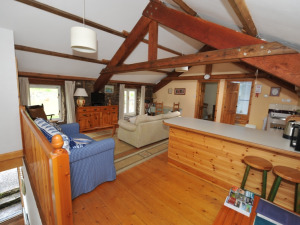 The Hayloft was very comfortable and clean with beautiful views over the garden. It had everything you would need and was a great base for visiting the Lakes. It sat in lovely grounds with great views. We just loved it. Thanks Julia and Nick. Thank you so much Mary, we're delighted that you enjoyed your stay - hope we see you again! 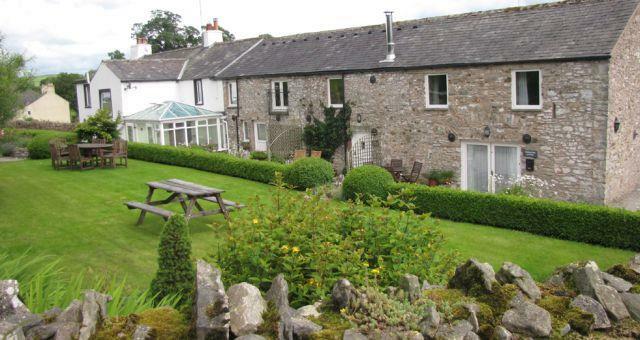 Located in a peaceful rural hamlet in the Lake District National Park. 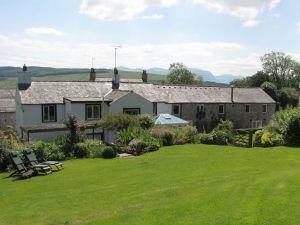 Easy access to fells, lakes and Solway coast. A 17th Century converted stone barn with lofted ceilings and exposed stone walls. We provide unlimited free wireless Wi-Fi at 3Mbps speed. Wifi wireless broadband internet access point but need own PC. Electric shaver points. Non-smoking. Children welcome from any age. From the north leave M6 jct 40 take the A66 to Keswick/Workington. After travelling for some 35/40 minutes you will come to a big roundabout and a garage on the opposite side. Go straight across this roundabout and drive down the hill to another large roundabout and take the second exit, the A595 to Carlisle. This road will take you across the river and up hill to another roundabout, go straight across, A595 to Carlisle. About 2 miles along this road you will see a sign on the left, which says Redmain, Blindcrake and Isel turn right. Drive down the hill and look for the 2nd house on the left, which has a gravel driveway, and you will see the sign for Huddlestone Cottage and the Hayloft. You have arrived. From the south, take the A69 or A74 to Carlisle. Then take the A595 to Cockermouth and Workington. Travel 20 miles approximately and you will pass Bothel on the right-hand side, then the Moota Hotel on the left-hand side about a mile further on. About 2 miles along this road you will see a sign on the right, which says Redmain, Blindcrake and Isel turn left. Drive down the hill and look for the 2nd house on the left, which has the gravel driveway, and you will see the sign for Huddlestone Cottage and the Hayloft. You have arrived.